1. Ground based inventory: Ground based inventory is done so as to establish a baseline through the measurement, to help construct a Reference Level, in partnership with the government. 2. Capacity Building: The idea while conducting forest carbon inventory is to capacitate both government, local communities, students and CSO members to exercise the learning on the whole REDD+ process. 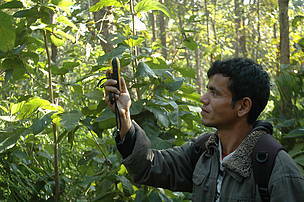 WWF has trained more than 250 people on forest carbon inventory. 3. Social, Economic and Environment Safeguards: WWF along with various partners is working with the Government of Nepal to design, safeguard, so that REDD+ implementation benefits nation, local communities and environment. 4. Cutting edge technology: With the ground based inventory, WWF Nepal also supported GoN to pilot the use of cutting edge technologies like LiDAR to help establish tier III level database and strengthen the national forest monitoring system. 5. Addressing drivers of deforestation and forest degradation: WWF is addressing the drivers of deforestation and forest degradation through restoration activities, providing access to renewable energy options to reduce pressure from the forests. WWF is also developing community based forest fire fighters, and providing alternative livelihood options towards sustainable management of forest programs. 6. Awareness: WWF is conducting various awareness programs on the process of REDD and various issues both technical and social. WWF is working on capacity building programs through media at national and local levels, indigenous groups, civil society organizations, marginalized groups and women groups. 7. Accessing Finance: WWF Nepal will work with all relevant stakeholders to support the government to access finance from REDD under different mechanisms. Ground based inventory for REDD.